Summon: Reveal three random cards in your opponent's deck. Choose one and draw a copy of it. Riften Pickpocket is a rare Intelligence creature card. It is part of the Heroes of Skyrim expansion. 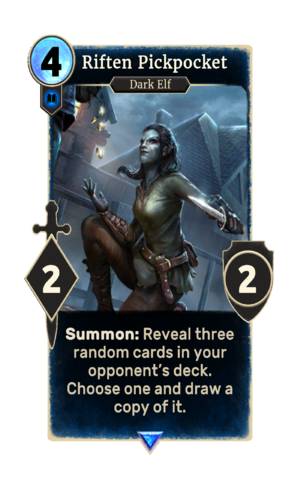 In addition to the card's availability in the Heroes of Skyrim expansion, two copies are included in the Brynjolf's Heist theme deck. "Holdin' on to anything interestin'?" "Shoulda just let me pick your pocket!" This page was last modified on 27 February 2019, at 22:50.